This Gugelhopf or Bundt Cake Recipe has a hint of sweetness but more resembles a bread than a cake! For equal opportunity, I’ll post Dad’s Christmas present too. I make this for him most years for Christmas. It’s his favorite! He’s not terribly big on sweets and this is NOT a sweet bread! This gugelhopf recipe came from a cookbook my Grandmother used in Germany since the early 1960’s. One of the authors has the same last name as my father but as far as he knows, they are not closely related. It is very easy for a yeast bread, no kneading! Now don’t get me wrong. Germans have some sweet desserts and breads, such as German Chocolate cake, which I have yet to put on BCC. I shall soon! 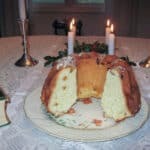 I hope you enjoyed the post today for Gugelhopf or Bundt Cake Recipe. Have you ever had a lightly sweetened yeast bread? They are sooo good! Thanks for stopping by BCC! Leave me a comment below! Here is a sampling of some of the other Christmas Goodies we made! Lightly sweetened vintage yeast bread. Take butter out of refrigerator and let it get to room temperature. Arrange walnut halves in bottom of pan, cut half of the walnut should face up. Measure 4 cups of the flour into large mixing bowl, add salt. Set aside. Mix the butter, 1 tablespoon of flour and 1 tablespoon of sugar with 1 of the eggs. Let rest for 5 minutes. Place milk on very low burner, in a small saucepan. Milk MUST be warm, between 100 and 110°F! If the milk is too hot, the yeast may be killed; if the milk is too cold, it won't activate. Grate lemon rind and measure raisins, set aside. After the butter mixture has rested 5 minutes, add the 1/2 cup sugar, the other cup of flour and the other two eggs. Check milk temperature,when it's at the proper temperature stir in yeast . Add the milk and yeast to the 4 cups of flour and salt and mix well with wooden spoon. Mix in lemon rind and raisins. Spoon into prepared pan, as evenly as possible. Cover with a clean kitchen towel and let rise in a warm place until almost to the top of the pan. With original yeast, 1 1/2 to 2 hours. With Rapid rise yeast, about 1 hour. Bake at 350 about one hour until golden brown (cover with foil if it gets too brown). I rap the bread with my knuckle, if the bread sounds hollow, it's done. A small caveat on the yeast, I have tried other yeasts, I will not mention names that just did NOT rise! The date was good, not even close to the expiration date. I double checked the temperature of the liquid. I tried twice with this brand last year and once with the same brand this year, luckily I proofed the yeast this year so that I didn't loose all the other ingredients (The reason I bought it was because I could not find my favorite in my town). it is very disheartening to say the least to loose all the ingredients and the work! This year, after the first package failed to proof, I traveled further and bought the only yeast I can trust, Fleischmann's. It's been around since the 1860's and I have never had a batch fail. « Mexican Turkey Soup with Leftovers! Delicious ???? not too sweet. Good for breakfast, snack or dessert!! Thanks Donna! We do like not too sweet breads for breakfast, don’t we? It has been years since I’ve had this! Looks delicious and adding it to my save for later recipes. This is so yummy any time of the day, but love it as an afternoon snack with a coffee. It’s great with coffee! My Dad used to dunk it in his coffee! Thank you Serena! I bet he loved it! It looks super yummy – and I love that it’s not a sweet bread! Great Gugelhopf recipe Beth, must absolutely try it, specially as my husband likes cake so much but I need to take care of his diabetes, thanks for sharing! Thank you, Patty! This recipe only has a bit of sugar compared to the flour!! Just 100g as opposed to 625g of flour. I love Bundt cake! Can’t wait to make it again next Christmas! It’s slightly different than the bundt cakes we are used to in the US. Oh wow, it has yeast! I would never have guessed. Sounds delicious! Yes, it’s really very good, as you can imagine! I’d have loved to have been at your house for Christmas! Everything looked so good, especially the bread! Thank you so much, Amy! Come on over any time! That looks so scrumptious!! My grandmother used to make something just like it! I can still taste it in my memory, to this day! Great recipe Beth! Thanks so much, Elaine! Your comments are always greatly appreciated! When we finally get a chance to visit each other, I will make you one! I love traditional recipes ….. the connect they have with the past and the stories that come with them. This looks fantastic! Yes, vintage recipes are fun to keep alive! Thank you Cleo!